The spring Half Marathon Training Program is starting this month! Join Coaches Heidi, Michele, and Chris and prepare for your spring half marathon! 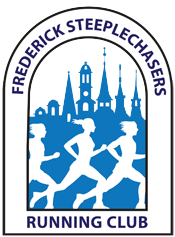 The target race will again be the Frederick Half Marathon on May 5th. An Information Meeting will be held on Thursday, February 7th at 6:00pm at Charm City Run. The first group run will be on Tuesday, February 12th at 6:00pm at Baker Park. All Steeplechaser training programs are FREE to paid members of the club and open to all paces. Registration is open and can accessed using this link. The registration page has information about the program, including dates and prerequisites. Keep an eye out for upcoming training programs: 10K Trail, COED 5K, Women’s 5K, Marathon…you name it! Of course, we are always looking for volunteers for the training groups, too. More information can be found on the Training Programs page.